"Surficial geology" refers to the study of landforms and the unconsolidated sediments that lie beneath them. The majority of the unconsolidated sediments found at the land surface were deposited during the late Wisconsin glaciation, 21,000 to 13,600 years ago. During this time, approximately two-thirds of the state was covered by glacier ice that originated in northern Canada. As the ice sheets expanded and moved south, they carved up the preglacial landscape beneath; therefore, much of the sediment we find in Indiana has origins in Canada, Michigan, Illinois, and Ohio. In Indiana, the unconsolidated sediments range in thickness from zero to over 500 ft, averaging about 250 ft in the center of the state. During the Pleistocene, North America experienced several periods of glaciation, each lasting tens of thousands of years, and these episodes of ice advance and retreat affected the landscapes of Indiana. Each major advance destroyed evidence of the previous episode, leaving evidence of only recent events. Reconstruction of Indiana's geologic history, through core sediment analysis, geophysics, and stratigraphy, give evidence of at least three major glaciations: pre-Illinoian, Illinoian, and Wisconsin. Pre-Illinoian deposits are rarely identified at the surface in Indiana; Illinoian sediments cover bedrock in the southwestern and southeastern counties; and Wisconsin sediments dominate the surface in the northern two-thirds of the state. The maximum extent of late Wisconsin ice is marked by a sinuous east-west boundary that passes near Martinsville in Morgan County. The subsurface (surface to bedrock) stratigraphy in northern Indiana reveals a complex glacial history with glacial sediments from each period stacked atop one another. The glaciers deposited the eroded substrate as various types of sediment, commonly referred to as "drift," in a variety of different environments and processes. Till is a homogenous, unsorted mixture of particles ranging in size from clay to boulders (known as erratics) deposited directly by the ice; Outwash is sediment that is transported and deposited by the direct action of glacial meltwater, and consists of sorted and stratified sand and gravel. Some sediments were deposited in glacial lakes and ponds, while others were transported by wind. 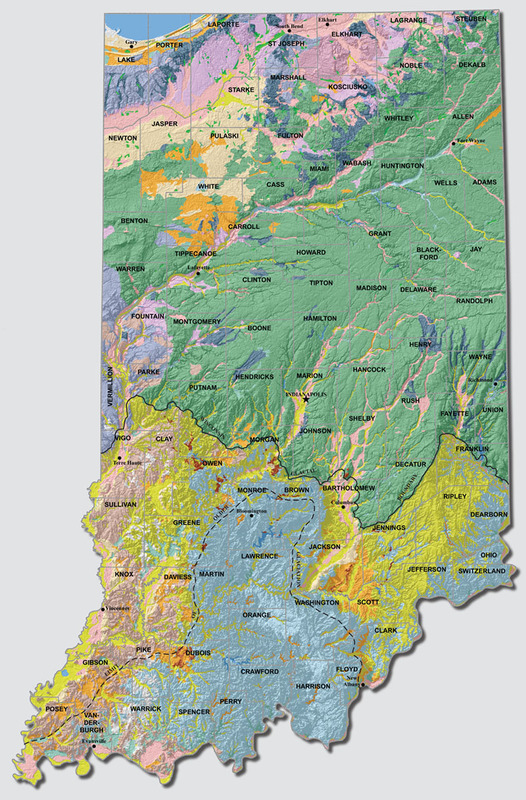 In Indiana, the different kinds of glacial deposits are stacked atop one another, and also are laterally interwoven; yet concentrations of one type dominate the state in large areas. Till forms flat to hummocky plains that dominate the central portion of the state. These are punctuated by subtle end moraines (long arcuate ridges of till) in northeastern Indiana. Outwash is prevalent in northern Indiana and along major river valleys that once served as meltwater drainages, notably the Eel, Kankakee, Whitewater, Wabash, White, and Ohio Rivers. Outwash deposits form broad, expansive aprons, kames (mounds), eskers (sinuous ridges), and line valley bottoms. These glaciofluvial deposits provide commercially viable sand and gravel resources for Indiana. Outwash was a source of clay, silt, and sand that was transported and deposited by wind in the form of dunes and loess. Large deposits of dune sand are found in northern Indiana, along the Lake Michigan shoreline and along the eastern margins of the Wabash and White Rivers; significant loess deposits are found in southern Indiana, adding to soil fertility. Many glacial lakes still hold water today, but many more dried up. The sediment that remains forms flat lake plains, marshes, and peat bogs, providing modest commercial products of clay and peat. Ice retreated from Indiana approximately 13,600 years ago. Postglacial processes of deposition and erosion then began to modify the glacial landscape, resulting in the sediments and features that make up the landscapes we see today.